Keith Hann - Why Oh Why? : Anyone know about teeth and speak English? 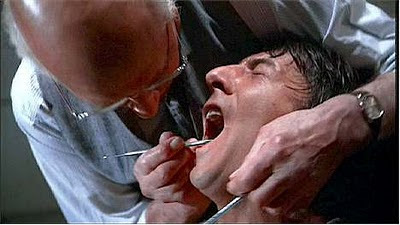 The low point of last week was the blazing row that culminated in the sacking of my dentist. Oddly enough, the argument had nothing to do with my teeth. It arose because, a month or so ago, I received a demand for £70 for an allegedly overdue bill for dental treatment. There were several reasons why I could not understand this, one of which was that the money was supposedly owed by my wife, who has only visited my dentist once and certainly not on the date claimed in the statement. But more importantly because I have always paid for our treatment before leaving his surgery, mainly in the belief that I would be rugby tackled to the ground if I tried to do anything else. So I rang up to query it, forgetting that my dentist has made the business-limiting move of employing a receptionist who can neither speak nor understand English particularly well. After five minutes of mutual incomprehension that seemed more like a long weekend in an offshore call centre, I gave up. Then I made the critical mistake of thinking that I really ought to put matters straight. So I wrote a nice, clear letter to the dentist himself, foolishly ignoring the near inevitability of its interception by the aforementioned receptionist. Who promptly rang me up and began blithering unintelligibly all over again. I suppose I must have lost my temper. At any rate, an HR lady for the client in whose offices I was working at the time told me that I would have been sacked for the resulting outburst if I had been one of her employees, which luckily I am not. Interestingly, the objection seemed to be simply to the volume of my comments rather than their content, or even to the colourful obscenity with which I rounded them off. So luckily I did not need to cite our great national treasure, the polymath Stephen Fry, in support of my contention that the hackneyed claim that using bad language denotes a limited vocabulary is complete expletive deleted. Apparently the latter always brings the phone crashing down at the other end. I suggested he tried saying “Mumbai” in future to see if that improves matters. I relieved my feelings by writing another letter to my dentist explaining why I would not be using him any more, and taking the precaution of marking the envelope “Strictly Personal”. The effects were instantaneous. First his receptionist rang up to offer a grovelling apology, though she had to do so in a voicemail message as I could not bear to pick up the phone when I saw who was calling me. Then the dentist rang in person, leaving another message in which he explained that the bill had been sent to me in error and that he could not be sorrier that I had been inconvenienced in this way. He added that he would be writing to me, so it came as no surprise when a letter from his surgery landed on my doormat yesterday morning. The content was a bit of a surprise, though. It was another statement of account reminding me that my wife has owed them £70 since October 2010 and demanding that I pay it by return of post. Can anyone recommend a dentist who is good with nervous patients, employs staff who speak English and has a rather more robust system of accounting?